On March 24th, 1930 one of the highest paid Hollywood actors Steve McQueen was born in Beech Grove, Indiana. McQueen's popularity skyrocketed after playing starring roles in huge hits like The Great Escape, The Thomas Crown Affair, Bullitt, and Le Mans. Eighty years from his birth, work is just starting on an epic biopic based around the actor's troubled childhood, rise to fame, and his struggles with his relationships, his anger, and his cancer. According to Deadline, the biopic will use information from the 2010 biography Steve McQueen: The Life And Legend Of A Hollywood Icon, as well as his personal diary sourced from his Mexican home. The movie will supposedly approach a unique angle focused on a secret McQueen managed to keep from the public - until now. As a huge fan of car culture, movies - specifically James Bond films - and motorsport I can not help but be excited at the notion of a film around the star of some of the best racing, heist, and action films I've ever seen. When it comes down to who I think will do the late and great Steve McQueen justice in his biopic, my only candidate is current James Bond - Daniel Craig. This is in no way an original idea of mine. From the moment Daniel Craig reached a wider audience with films like Layer Cake, Munich, and Lara Croft: Tomb Raider people have been comparing his looks and stature to that of Steve McQueen. Yet when I realized that today was Steve McQueen's birthday and remembered the news of his upcoming biopic, it was the recently released teaser poster for the upcoming Bond film SPECTRE that stood out to me. The teaser poster for SPECTRE is a throwback to a publicity photo of Roger Moore as James Bond in his first feature Live And Let Die, which was SPECTRE director Sam Mendes' first Bond film in theaters. You can expect his upcoming Bond film to homage heavily to that experience. The Roger Moore publicity shot is supposedly an homage to Steve McQueen's look as Bullitt in the 1968 movie of the same name - a black turtleneck and leather shoulder holster. 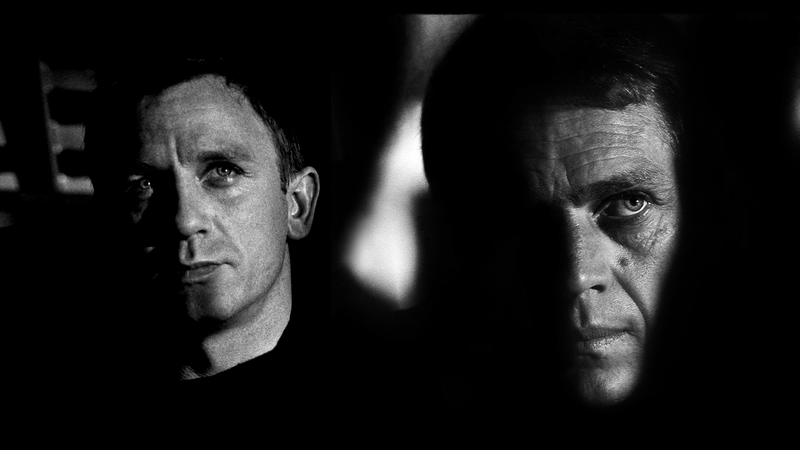 Steve McQueen and Daniel Craig share blue eyes, light hair, and similarly defined facial features. They are both 5'10" and and have starred in similarly-styled films (yet not always similar in quality). The Magnificent Seven and Cowboys & Aliens, Bullitt and Casino Royale, The Thomas Crown Affair and Layer Cake to name a few. Daniel Craig, like McQueen in his time, is also one of Hollywood's highest paid actors, with his salary for his Bond role almost doubling for each film he has made. His net worth is reportedly over $65 Million and growing. While not a self-proclaimed automotive enthusiast, Craig does own (or has been gifted) a number of Aston Martins, and has been employed as the image of the new Land Rover promotions, as well as piloting the famous Aston Martin DB5 at the company's centennial celebrations last year. They've also both gone through a few marriages, if it matters. Craig's age may be an issue, him being only three years younger than fifty, the age at which McQueen passed of a heart attack, but the man is in great shape - doing his own stunts for his Bond films - and has maintained a jovial and youthful look and attitude. He looks primed to convincingly portray McQueen at the height of his career. With a break in Daniel Craig's schedule after the release of SPECTRE this year, the timing is right to see one of the most popular, highly paid actors in current Hollywood play one of the most popular, highly paid actors of Hollywood past. Now who do I have to write? Who do you think will be great to play Steve McQueen? Check out Beyond James Bond for more James Bond related news and information. Follow me on Instagram at beyondjamesbond for daily posts about the production of SPECTRE, the James Bond franchise movies and novels, and beyond.